Peace By Pastries: Eating Vegan in Indy, Part 2! I've done some more investigating and found some more awesome places to eat vegan-style in (and around) Indianapolis...I'm loving this city more and more with each meal! First, for non-Indianapolis food: the Owlery, a new vegetarian/vegan place in Bloomington, IN, which is only about 45 minutes away. This place is awesome!! It's main focus is on veg versions of comfort foods, such as tofu ribs and vegan fish'n'chips. The food is absolutely delicious! My friend and I shared the Vegan Poutine for our appetizer! Holy cow! If you're unfamiliar with poutine, it's basically just french fries smothered in gravy and topped with cheese curds. Yeah. This version had vegan cheese and an awesome veg brown gravy. Salllllllt and fried goodness. 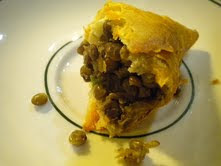 For my entree, I had Piegrogies!!! I haven't had pierogies since going vegan, so this meal was super special. I got to choose three condiments from a long list, so I picked sauerkraut, vegan sour cream and applesauce. Best meal I've eaten in a long time! Carbs!! First, for fantastic Mexican food, there is La Parada! My friends and I go there weekly, it's that good! It's a little hole in the wall, and it is run by a wonderful group of people. For veg options, just ask for dishes with beans and no cheese or sour cream. There's also the Spanish rice, guacamole, and free chips and salsa! Score! My favorite item is the Gordita Rajas, with roasted poblano chiles it in..just ask for avocado instead of cheese and you're good to go! One of my favorite places to eat in Indy is the Ethiopian restaurant Abyssinia. I love love love Ethiopian food, and this place does it right! A very wide (and delicious) vegetarian menu, relaxing atmosphere, and great staff. What's not to love?? 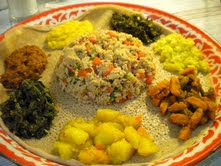 For the entree, I recommend sharing the Vegetarian Taste of Abyssinia platter, which comes with a little of each veg option on the menu. So great!!! It's perfect for sharing, so bring someone with good taste to dinner with you! I also love the Fitfit, which is like a salad made with chopped up injera, tomatoes, jalapenos and a vinegar-based dressing. Hooooly cow. 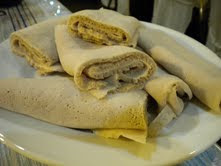 And of course, all the dishes are served with Injera, the spongy flatbread made out of a fermented teff batter. I wish I had a piece of it the size of a beach towel I could wrap myself in and then eat the whole thing. Maybe that's just me! 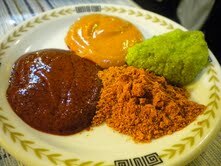 ha And, if you ask, they will bring you a little plate of condiments for dipping and whatnot. So so spicy and flavorful and gooooood. Next there is Bosphorus, which is a lovely little Turkish restaurant in the Fountain Square area. It's in a super cozy old house, with fantastic food. I opted for the hummus and pita for the appetizer, which was the best idea ever! Amazing grilled, warm, soft pita (homemade!) and the creamiest hummus I think I've ever eaten. For my entree, I got the Falafel, which was on the Mezze menu, but I got it for my meal. Sometimes, I just have to eat falafel. I just have to!! This was served with hummus, veggies, and a tahini sauce, which rounded it out to be seriously perfect! Everything looks totally amazing. I've never tried Ethiopian food but everyone says its the way to go. The Mexican food and pierogies are especially calling my name. Oh em geeee!! I want to come stay with you - i am drooling! Living in a dorm and being cut off from good food is killing me. I wish i could om nom this post! Real food enthusiast, paleo chef, nutritionist, herbal medicine pusher, lover of life. I also do nutrition and herbal consultation! If you are in the Portland, OR area, email me at RisingMoonPDX@gmail.com if you are interested...or just want to say hi/meet up for coffee! !